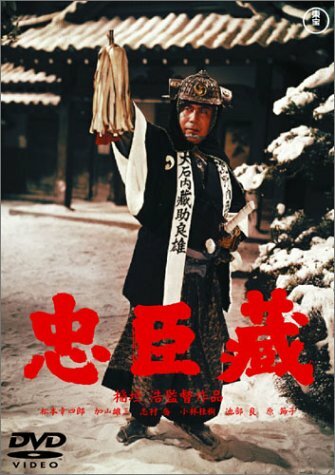 Lord Asano (Yuzo Kayama) won't bribe the corrupt Kira (Chusha Ichikawa), a court protocol expert who procedes to do everything possible to discredit the young and idealistic Lord. Asano is forced to pay a fortune to have a building's worth of floormats replaced overnight to pacify the selfish and greedy Kira, but he still won't bribe him. To make Asano grovel, Kira withholds vital protocol information for an important meeting. Finally Asano cannot bear the humiliation, loses his head, and attacks. He is subdued after only wounding the cowardly Kira. Drawing a sword within the Shogun's palace is a capital offense, and Asano's sentence is carried out with yet more protocol ending in a formal seppuku ceremony: Asano disembowels himself with a knife and is decapitated by a headsman. Asano's fate isn't the end of grief; his estate and castle are forfeit, and his vassals, including his family and the 47 samurai who serve him, are left both destitute and dishonored, banished from royal life. Expecting the 47 to defend the castle in a renegade outlaw battle, the Shogun's agents are surprised when their leader, Kuranosuke Oishi (Koshiro Matsumoto) not only surrenders it, but does repairs first. The samurai scatter and those that settle nearby are the source of constant gossip. Are they really pacified, or do they secretly plot to get revenge against Kira for their lamented Lord Asano? How will honor be regained, and their conflicting obligations to their Lord and their Shogun be satisfied?